My interest in Harry Callahan was piqued when Joe Cornish showed me some of his work and I also saw him mentioned in relation to Minor White and Steiglitz. I saw a book called 'Elemental Landscapes' whilst searching on Alibris and had to buy it. I also bought 'Harry Callahan - The Photographer at Work' from Amazon. beautiful. I haven't seen any original prints of Harry's but from this introduction I shall be looking them up. I've included a few of the pictures along side this text and a few photos from the book below. 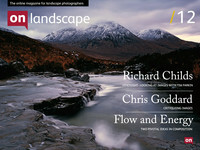 Altogether though, a highly recommended sampling of the landscape photography aspect of a great photographers life. The Photographer at Work is a little more comprehensive and covers all angles of Harry Callahan's life. These include quite a bit of street photography and also many photographs of his wife and abstract constructions, almost collages, from his teaching work. The book is again very well written and describes how Harry developed his style and has intruiging insights into his working process (he used to photograph every day and took thousands of photographs in a year). Another recommended book but for the landscape photographer, I would recommend just buying 'Elemental Landscapes' for a starter.